You can view details of the installed license in the License tab of the License Information window. To open the License Information window, from the main menu select License. Status — license status (Valid, Invalid, Expired, Not Installed, Warning, Error). Expiration date — date when the license expires. Type — license type (Perpetual, Subscription, Rental, Evaluation, NFR, Free). Edition — license edition (Community, Standard, Enterprise, Enterprise Plus). Licensed to — name of a person or organization to which the license was issued. Contact person — name of a contact person in an organization to which the license was issued. [For perpetual licenses] CPU Sockets (Hyper-V) — number of licensed CPU sockets on protected Microsoft Hyper-V hosts. [For perpetual licenses] CPU Sockets (vSphere) — number of licensed CPU sockets on protected VMware ESX(i) hosts. Instances — number of instances that you can use to protect workloads. [For per-instance licenses] Monitoring — parameter that indicates whether Veeam ONE allows monitoring of the Veeam backup server on which the current license is installed (Yes, No). 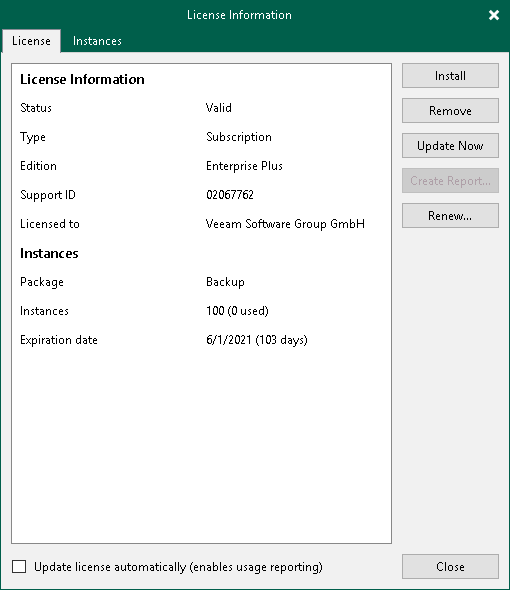 For details, see the Types of Licenses section in the Veeam ONE Deployment Guide. Support expiration date — date when support expires.